Moving on up! 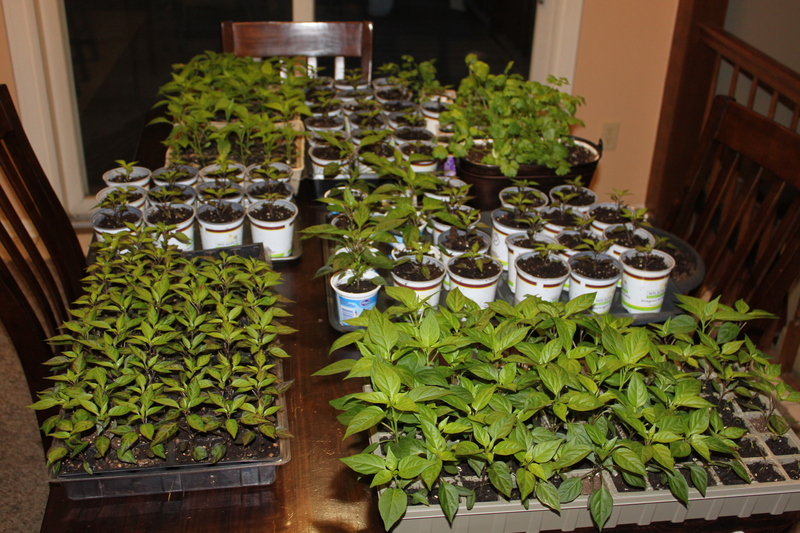 Ornamental Pepper plants get a new home. The weather continues to warm here in Ohio – tempting us to cheat mother nature and skip the whole seedling transplant step and head straight for the flowerbeds and garden. However – in spite of the temptation, reality set in and Saturday we began to move all of our seedlings into larger individual pots. Mary went to our local nursery, who has a recycled plastic pot program – where they gave her close to 75 16 oz. pots for a nickel a piece – an unexpected find that saved us some cash! So we spent the morning transplanting the pepper plants into new homes – where they will spend the next four weeks expanding their root structure before finding their permanent home in our landscape and garden. The transplanted Sangria Pepper plants get some much needed space to expand! 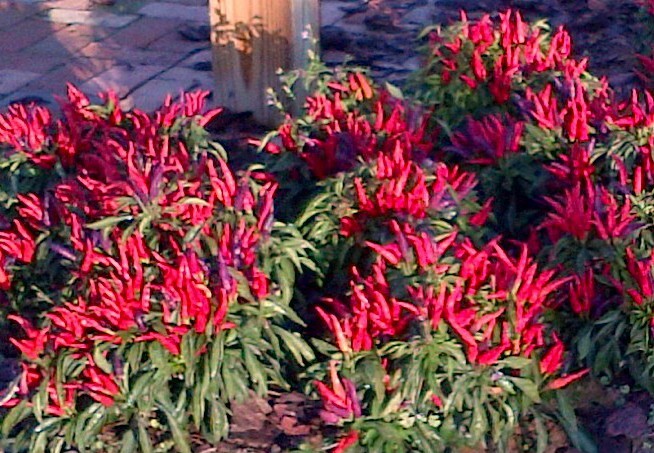 Ornamental peppers are an absolute favorite of ours. They get big with hundreds and hundreds of tiny peppers of all different colors. We grow and save our own seeds from our favorite variety – the Sangria Pepper – and this year have expanded to two additional seed varieties, the Poinsettia and Tangerine Dream. We use these for mass planting in the flowerbeds to give big blasts of color to our landscape. The peppers have proven over the last few years to be one of the most durable, well producing and colorful editions to our landscape. One of the most frequent questions we are asked is “Can you eat them?” The short answer is – most of the ornamental varieties – like Sangria have little or no taste and are not great for consumption. However, there are some varieties – like Poinsettia and Tangerine Dream that produce a small edible pepper that are great to flavor soups or dips. Transplants filling up the kitchen table! 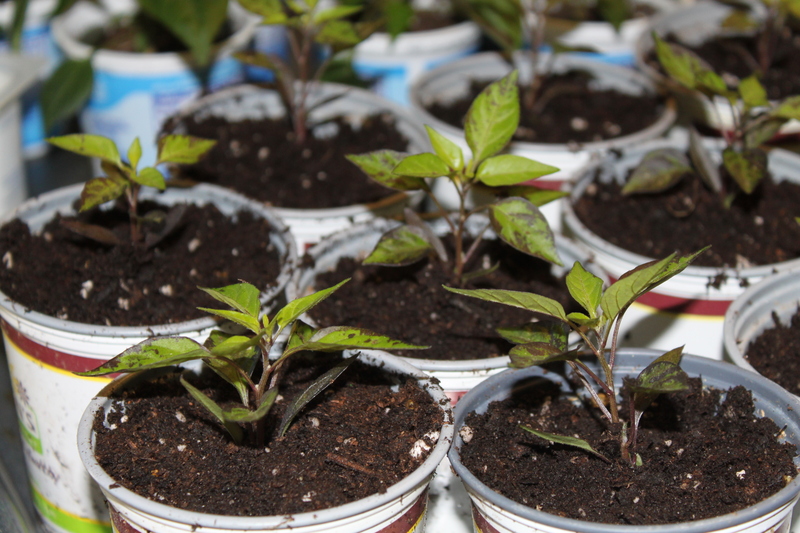 This year, we expanded the pepper seedling production to several hundred plants – tripling what we have ever tried before. (and taking away our dining room for a few weeks!) We will use about half of those for our own landscape – and sell the others to friends and a couple of small local nurseries. We hope to build our own greenhouse on the property later this fall – and with a little luck, hit our goal of 1000 seedlings next year!